Shoghi Lawful Interception Solution for cellular networks has been designed to intercept the traffic of GSM and CDMA cellular users from Telecom Service Provider’s switch. Shoghi provides a comprehensive solution that delivers state-of-the-art surveillance capabilities for interception of Voice Calls, SMS, sent/received e-mails, browsed Webpages, Facebook, Twitter, Skype (voice call log) and VoIP sessions along with CDR from GSM and CDMA cellular networks. System is also equipped with CDR analysis application to perform the automatic linking and associations of the targets. SCL-LICN is equipped with HTTPS interception module to handle the IP traffic from HTTPS/SSL secured site like Facebook, Twitter, Gmail, Yahoo Mail etc. SCL-LICN is capable of monitoring Voice and SMS along with CDR from traditional GSM and CDMA networks and IP data from next generation packet-switched networks, 2G/3G mobile networks (e.g. GPRS, EDGE, UMTS). System provides interception of e-mail, browsed webpages, and VoIP sessions etc from IP data. 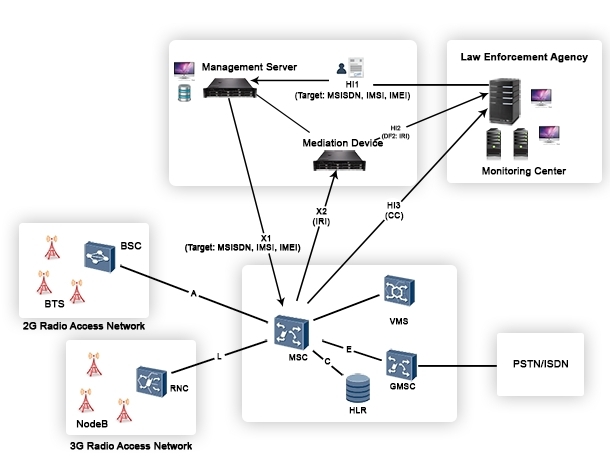 The SCL-LICN solution usually acts as a bridge or mediator between the service provider's network and the LEA's monitoring centers. The SCL-LICN supports both ETSI and CALEA interface and can be integrated with switches of popular manufacturers like Alcatel Lucent, Juniper, Ericsson, Cisco etc. Shoghi provides turnkey solution which covers Probe, Mediation device and Processing Server at the service provider’s side and target provisioning system at LEA side. Shoghi’s Probes, mediation device and provisioning systems can be suitably customized to integrate with service provider’s switch to implement the interception as per specific national legal requirements. Can be integrated with HTTPS Interception module to handle the traffic from HTTPS/SSL secured site like Facebook, Twitter, Gmail, Yahoo mail etc.